Can you eat foods that contain garlic when you're breastfeeding? Is it safe for your baby or should you avoid it? If you're worried about eating garlic and how it will affect your child and your breast milk, you're not alone. Here's what you need to know about garlic and breastfeeding. Garlic (Allium sativum) is a commonly used ingredient found in many recipes all over the world. But, garlic is more than just a flavoring for food. Throughout history, the medical benefits of garlic are well noted. The actual origin of garlic is not known. However, the use of garlic dates back at least 5,000 years to ancient Egypt. It was found in King Tut’s tomb, and there are records of its use in ancient Greek, Roman, and Chinese medicine. Garlic contains vitamins, minerals, and amino acids. It is also made up of sulfur compounds, which are responsible for most of its beneficial health properties and, of course, its strong odor. Over the centuries, garlic has been taken to treat infection, swelling, and problems with digestion. Even today, the uses of garlic are many. It's food, a dietary supplement, and a medicinal herb. Can You Eat Garlic If You're Breastfeeding? It's perfectly safe to eat garlic while you're breastfeeding. As long as you and your baby tolerate the garlic in your diet, there's no need to try to avoid it. Eating garlic in moderation can be very beneficial to your health and your breast milk supply. Can Garlic Change the Taste of Your Breast Milk? Garlic from the foods that you eat does travel into your milk. The strong, pungent odor of the garlic can not only change the smell, but it can also alter the taste of your breast milk. Can Garlic Cause Colic in Babies? Some babies like the taste of garlic and are not at all bothered by it. But, others may become fussy and irritated. For infants that suffer from colic, garlic is one of the foods that may contribute to that condition. If you believe garlic is causing issues for your child, you may want to try eliminating it from your diet for a while to see if it makes any difference. Will Eating Garlic Increase Your Breast Milk Supply? Garlic is believed to be a galactagogue, and it has been used for many years as an herbal treatment to stimulate breast milk production and increase the supply of breast milk. When studied, it was observed that when breastfeeding mothers consumed garlic, their infants stayed at the breast and breastfed longer. And, since an increase in breastfeeding can lead to an increase in the breast milk supply, this may be one of the reasons garlic can help breastfeeding moms make more breast milk. You can easily add one or two cloves of garlic into your everyday diet through the foods that you eat. You can use it to flavor a variety of dishes including vegetables, meat, pasta, and seafood. Just remember, like everything else, you should eat garlic in moderation. The best way to benefit from the health and nutritional properties of garlic is naturally, by adding fresh cloves of garlic to the meals you prepare. You should not take garlic supplements or high doses of garlic that are meant for medical purposes unless a doctor or trained herbal specialist prescribes it for you. Just like any other herb or medication, always talk to your healthcare provider before starting any supplements. Promotes Lactation: In addition to helping increase the supply of breast milk for nursing mothers, it has also been suggested that babies who like the taste of garlic in the breast milk latch on and breastfeed very well. Supports Digestive Health: Garlic is beneficial for digestion and the digestive tract. 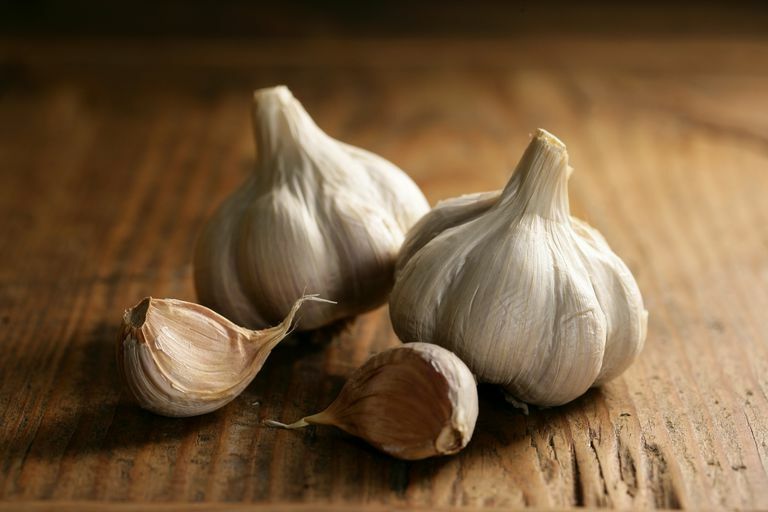 Improves Heart Health: Garlic dilates blood vessels so it can help lower blood pressure. It is also used to lower cholesterol, thin the blood, and decrease the risk of heart attack. Acts as an Anti-Infective: Garlic has been used to treat bacterial and viral infections. It may help to keep away or shorten illnesses. Has Anti-Fungal Properties: Eating garlic might help prevent an overgrowth of yeast when taking a course of antibiotics. It may also give your immune system a boost to help you and your baby ​fight off thrush. Other Uses and Benefits: Garlic may be useful in the treatment of colds, insomnia, asthma, and cancer. Garlic can be dangerous if it is given directly to a baby. The only way your child should receive the benefits of garlic is through your breast milk. Garlic can be irritating to some women and some infants. If you or your baby do not tolerate garlic well, stop using it. Garlic can lower your blood sugar levels. If you suffer from hypoglycemia or diabetes, avoid using too much garlic. The overuse of garlic can thin your blood. Be careful if you're taking anticoagulant medication (blood thinners). Garlic has been called the cure-all, and it is certainly an overall healthy addition to your breastfeeding diet. However, you should only consume garlic through the foods that you eat, and you shouldn't take garlic supplements unless you are under the care of a doctor or nutritional specialist. Garlic is an ingredient in so many recipes that you'll probably get at least some garlic in your diet while you're breastfeeding. If you and your baby tolerate it without any issues, there is no need to try to avoid it. However, if you notice that your child develops colic-like symptoms after you have a meal that includes garlic, you may want to see if eliminating garlic from your diet is helpful. Jacobson, Hilary. Mother Food. Rosalind Press. 2004. Mennella JA, Beauchamp GK. The Effects of Repeated Exposure to Garlic-Flavored Milk on the Nursling's Behavior. Pediatric Research. 1993 Dec 1;34(6):805-8.